This is a very important first step and a necessary step, Morgan Stanley CEO James Gorman said. 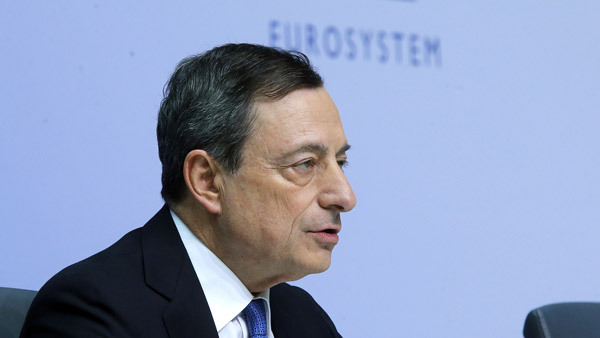 Mario Draghi led the European Central Bank into a new era with an historic pledge to buy government bonds as part of an asset-purchase program worth about 1.1 trillion euros ($1.3 trillion). The ECB president side-stepped German-led opposition to quantitative easing in a once-and-for-all push to revive inflation and the euro-area economy. The central bank will buy 60 billion euros per month of securities until September 2016. The ECB also reduced the cost of its long-term loans to banks. A near-stagnant economy and the risk of deflation forced Draghi’s hand six years after the Federal Reserve took a similar step to inject cash into the U.S. The 67-year-old Italian’s gamble is that the benefits of quantitative easing outweigh the threat of a backlash in Germany. Investors reacted by selling the euro and buying European stocks. The currency extended declines as Draghi spoke, weakening 1.2% to $1.1473 at 3:30 p.m. in Frankfurt. Athanasios Vamvakidis, head of G-10 foreign-exchange strategy at Bank of America Merrill Lynch, said the plan was at the high end of market expectations. The Euro Stoxx 50 added 0.8%. The ECB’s shift exacerbates an emerging global divergence in monetary policy. While the Fed is now considering when to tighten credit, central banks in Denmark, Turkey, India, Canada and Peru all announced surprise rate cuts in the past week. The Swiss National Bank shocked investors by dropping a cap on the franc. Reflecting the drive for consensus that has been a hallmark of Europe’s response to years of rolling crises, Draghi made concessions to secure as much support as possible for QE. The curbs are aimed at calming concerns aired most loudly in Germany that the ECB is unfairly aiding uncompetitive nations that do little to help themselves and stepping into politics by effectively mutualizing debt risks and financing governments through the back door. Bundesbank President Jens Weidmann has described quantitative easing as “sweet poison” for governments. “We took these concerns into account and that’s why this decision will mitigate those concerns,” Draghi said. That’s particularly relevant now as Greek elections in three days could bring to power a party seeking to renegotiate the country’s debts, most of which are held by European taxpayers. The downside of the horse-trading is that the program potentially packs less punch and the unwillingness to share risk exposes fault lines in the monetary union. If investors reject it as insufficient, the ECB may have to do even more later. –With assistance from Alessandro Speciale and Angela Cullen in Frankfurt, Catherine Bosley in Zurich, Scott Hamilton, Jennifer Ryan and Brian Swint in London and Karl Stagno Navarra in Valletta. Swiss Franc Move: What Does It All Mean?